This species and the Ammodramus maritimus spend the winter among the salt marshes of South Carolina, where I have observed thousands of both late in December, and so numerous are they, that I have seen more than forty of the latter killed at one shot. At that season, the neighbourhood of Charleston seems to be peculiarly suited to their habits, and there they are found in great abundance along the mouths of all the streams that flow into the Atlantic. When the tide is out, they resort to the sedgy marshes, but on the approach of the returning waters, they take wing and alight along the shores and on the artificial banks formed for the protection of the rice fields. The flight of this species is so different from that of any other Finch, that one can easily know them at first sight, if he only observes that when flying from one spot to another, they carry the tail very low. During winter, both species are provided with an extra quantity of feathers on the rump. This circumstance has not a little surprised me, when I found them residing in a climate where the Blue Heron (Ardea coerulea) also is now and then to be seen in the young state during winter. I am indeed of opinion that most birds of this species and of the other remain here the whole year, and that if some go farther south, they must be the weaker and younger birds, whose constitution is unable to bear the least degree of cold. These Finches keep so much about the water, that they walk upon the floating weeds as unconcernedly as if on land, or on any drifting garbage raised from the mud at high tides; they congregate and feed together, and doubtless are constant companions until the spring, when these species separate for the purpose of breeding. The Sharp-tailed Finch is rather silent, a single tweet being all that I have heard it utter. In spring their attempts to sing can hardly be said to produce a series of notes that can be dignified by the name of song. They feed on the smaller species of shell-fish, on shrimps, and aquatic insects or crustacea, as well as on the seeds of the grasses growing on the grounds which they inhabit. Within a few years this species has extended its range towards the eastern portions of the Union, as far as the vicinity of Boston, perhaps farther. I doubt, however, that they ever reach the State of Maine and the British provinces, chiefly because the shores of those countries are rocky, and because very few salt marshes are to be met with there. None were seen by me in Newfoundland, Labrador, or the intervening islands. The young birds of this species are considerably lighter in the tints of their plumage, during winter, than their parents. Some shot on the 11th of December, in the neighbourhood of Charleston in South Carolina, were so pale as almost to tempt one to pronounce them of a different species. At that period, the mornings were very cold, the ground being covered with a thick white frost. So very intent are they on visiting the interior of the broadest salt-marshes, that on returning, when the tide declined, to the same banks where we had seen so many at the time of flowing, we could scarcely find an individual. They are, however, less addicted to search into the muddy recesses along the creeks and bayous than the Sea-side Finches. 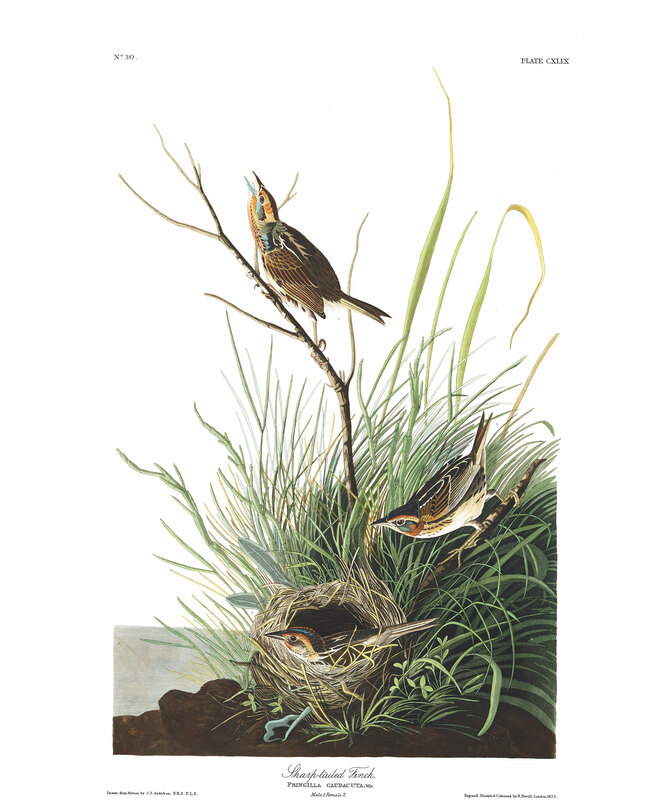 The nest is placed on the ground, as represented in my plate, at the distance of a few feet from high-water mark, and generally in a place resembling a portion of a newly mown meadow. A slight hollow is scraped, in which are placed the delicate grasses forming the nest, disposed rather loosely in a circular form. The eggs are from four to six, rather small, dull white, sprinkled with light brown dots, more numerous towards the greater end. About Cape May and Great Egg Harbour, two broods are usually raised in a season; but from the immense numbers seen in autumn, when they begin to congregate, I am inclined to believe that in many instances they have three broods in the same year, especially in South Carolina and Georgia. I saw none of these birds on the eastern coast of the Floridas. They are most easily shot on the wing, for while among the sedges and tall grasses, they move with great celerity, gliding from one blade to another, or suddenly throwing themselves amid the thickest parts of the weeds, where it is impossible to see them. According to my friend Dr. T. M. BREWER, "this species is not rare among the high grass upon Chelsea Beach, near Boston, in the summer, where it no doubt breeds. It runs with wonderful speed, and is unwilling to take wing until almost trodden upon." Breeds from Texas along the coast to Massachusetts. Never in the interior. Resident in the Southern States. Very abundant. SHARP-TAILED FINCH, Fringilla caudacuta, Wils. Amer. Orn., vol. iv.p. 70. FRINGILLA CAUDACUTA, Bonap. Syn., p. 110. SHORE FINCH, Fringilla littoralis, Nutt. Man., vol. i. p. 504. SHARP-TAILED FINCH, Fringilla caudacuta, Aud. Orn. Biog., vol. ii.p. 281; vol. v. p. 499. Second, third, and fourth quills longest, first and fifth equal; tail graduated. Upper part of the head with a central bluish-grey streak, deep brown at the sides, with the feathers black in the centre; hind neck dull grey, tinged with brown; back brown, tinged with grey, some of the feathers marked with black and edged with greyish-white; quills dusky brown, edged with reddish-brown, the secondary and smaller coverts with their outer webs chiefly of the latter colour; tail-feathers dusky brown, margined with greyish-olive; a broad band of light yellowish-red from the base of the upper mandible over the eye, and extending beyond the middle of the neck, where it is broader; ear-coverts grey; a broad band of yellowish-red from the lower mandible down the neck; throat whitish, with a line of dusky streaks on each side; the lower part of the neck, a portion of the breast, the lower tail-coverts, and the sides, pale yellowish-red, streaked with dusky; the rest of the lower parts white.